Hi and welcome. I've spent a lot of time posting relevant information about saws, saw care and related topics. As much as I would like to get back to everyone that writes with a personal message, I find that I'm spending too much time answering the same emails, so I thought I would answer some of the most common questions for all to read first. Please read the Frequently Asked Questions (FAQ) immediately below before contacting me. Please understand if you do write, and don't hear back, then your question is probably answered on the website. Q: I have a saw, can you tell me about it? A: No. That would be like asking me, I have a car, can you tell me about it? Really folks, I can't possibly read your mind. And even if I could, please see question 3. Q: I have a saw that my grandfather gave me. It's a Disston D8. Can you tell me how much it is worth? A: Yes, I can. I used to do this routinely for people who asked, but I found that as Ebay took off, more and more people wanted to use me to figure out how much their saw was worth so it could benefit them. I used to just put those requests in the trash. However, upon reflection, I realized I could help the people who wanted to know about their saw by requesting a nominal fee for my expert appraisal. You can read about and buy it here. Please understand that requests to talk about your saw that don't go through this process will be met with no response. There is only so much time in the day. Thanks for your understanding. Q: I have a Sears and Roebuck tablesaw made in the 1940s? Can you tell me about it / want to buy it / have spare parts for sale? A: Sorry, we deal in hand tools, Friend. Q: I have a saw that looks old and has a bump or "nib" near one end of the blade. It's on the side that doesn't do the cutting. What is the purpose of this "nib"? A: The purpose is to look nice. Really, it was a decorative feature and doesn't have any practical use. Many people have theorized it was for scribing arcs, starting a cut, etc. However, Disston writes in their own literature that is was merely decorative. Hope this clears it up. Q: I have a saw that needs sharpened, can you do it for me? A: Yes we can! For details, please visit our saw filing service page, located here. Q: I have a saw that is missing some nuts, do you have any for sale? A: No, sorry. I get about 50 requests like this a week. I maintain a small supply from junked saws to replace missing nuts for saws I sell on the site. You might consider stopping by yard sales or look for junk saws on Ebay. For a couple bucks you can get a set of 4-5 and have a few spare. There are no new saw nuts made as far as I know. Alternatively, this service is provided with my Restoration Service located here. Q: Why do your saws cost so much? I can buy the same thing on Ebay for half the cost. A: Well, you certainly could. And when it arrives, it will certainly be dull, with the teeth possibly needing recut and set as well as filed. There will no doubt be a kink in the blade which you won't be able to straighten, and there could likely be other damage that you can't see. I turn over all the rocks so you don't have to. When your saw arrives, it is sharp, set and ready to cut. All the saws I sell are sharpened by me. I have sharpened literally 1000s in my lifetime (no joke!). That's what you get for your money. I'm not embarrassed about the price I ask and have NEVER had anyone send a saw back to me, for any reason. So, buy with confidence. Either way, I'm glad that you stopped by the site. Q: I really like your site, and want to buy a saw, but every time I stop by everything is sold out. What can I do? A: We apologize for that. We update the inventory a few times a year--it is a very time consuming process. It also appears that demand exceeds supply. We notify customer who have placed orders with us in the past when a major update occurs. If you would like to be added to that list, set up a user account in the store and request to be notified of updates. It is located here. Q: I have some saws and other tools, are you interested in buying them? A: Sure. When writing, please send a good photo, and how much you want. Please don't put me in the position of placing a value on your tools and then asking me to buy it. Q: I want to buy a two man crosscut saw, do you ever get them in stock? A: These don't really hold an interest for me, and they are hard to ship. I may at some point carry new ones on my site, but at this time don't carry them for sale. I admire you for wanting to use one though, and I do offer tools to keep them sharp in my maintenance section. Q: Aren't you that same guy who started a company called Independence Tool? A: That's me. I started it with a guy named Patrick Leach back in 1996. We worked together for a while, and then parted, each pursuing our own interests. I continued on for a couple years, and then sold the business to Thomas Lie-Nielsen. He still makes a good tool. If you bought a saw from me back then, you have my thanks. I hope it still is working for you. They were made to last a lifetime. Q: How did you get interested in all this saw stuff anyway? A: Well, it's a long story. The Cliffnotes version is, when I was a kid, my Dad owned a mill, where he turned lumber into various products like flooring and paneling. From an early age, I helped out around the shop. I can remember one summer when I was 13 cutting out a couple thousand blanks on a 36" Tannewitz bandsaw. I also worked a lot around jointers and planers (I still have all 10 fingers). This continued right up through college. At the same time, I had a grandfather who made rifles entirely by hand using chisels and scrapers. I was always interested in hand tools, but never knew much about them. Unfortunately, he died before I could find out more. Fast forward to 24 years ago. I was in the Army serving as a Chemical Officer, and went to a flea market and saw an old hand saw. I bought it on a whim, and then tried to find out who made it. It was a Disston #7. You guys have it easy...there wasn't much of an internet back then. Anyway, I taught myself to file and tuned it up, and got interested in saws. An interest turned into an obsession. Along the way I've collected quite a few, and also quite a few woodworking tools as well. I'm a pretty good woodworker. Hope that clears it up. Be careful, or in 24 years you might find yourself where I am! Q: Speaking of your Dad, does he still sell lumber? A: Yes! After you get the saw of your dreams here, but some first class wood to cut with it. Dad runs a brisk business on the web, selling curly maple, figured cherry and other exotic hardwoods. He'll ship anywhere in the world. Stop by his site. Q: Where can I find out how to file my saw? A: Right here! Just visit the library section of our site, and there are complete instructions there. In addition, we also sell the stuff you need to learn. Q: OK, after looking over your saw filing primer, I'm sufficiently inspired to learn how to file. I don't want to practice on a high quality saw though. What should I do? A: I get a lot of requests about this, so many that I created a special collection of saws devoted to the topic. I've rounded up a bunch of saws that aren't anything special, but with the proper clean up and sharpening, they will make a great tool. You pick the saw and the pitch teeth you want to practice on, I'll cut new teeth in it and ship it along with the proper file and file handle, all for a low cost. It's the most painless way there is to learn how to file. Stop by the saw kits page for details and to review our current selection. Q: I found a saw and I want to clean it. What should I do? 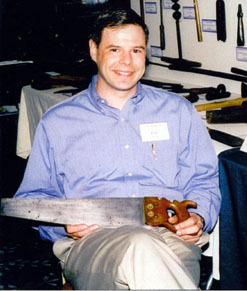 Q: Are there any clubs or other organizations that I can join to learn more about saws and other antique hand tools? A: Yes, as a matter of fact there are. I'm a member of the Midwest Tool Collectors Association. Don't let the name fool you, although the started in the Midwest, they are nationwide. They have two large national meets a year, where you will be able to buy all the tools that you ever imagined. I highly recommend that you join. Like the Fine Tool Journal, it's money well spent. They also publish a club magazine called the Gristmill, 4 times a year. And it that wasn't enough, they mail out a free reprint of an old catalog every year. These are really cool, and make a great reference. All that for $25. Q: OK, I've read all this, and I have a question that wasn't answered. How do I reach you? A: Hit the Email link at the bottom of the page. It's possible that I won't get back to you right away. If you don't hear from me in a week, then your question is probably answered somewhere on the site. In any case, I hope you enjoyed your time here.